Programming Windows 8 Applications with C# is a book for you if you want to know how to build Windows 8 Applications. You will able to learn about how to work with Metro Design language in this book. Programming Windows 8 Applications with C# will also help you in learning how to work with Windows RT operating system which is must for building Windows 8 Applications. After reading this book, you will be able to build Windows 8 Applications for Desktop PC's and Tablet PC's. Programming Windows 8 Applications with C# is a perfect book for the .NET Developers. This book is filled with the important C# example codes which will help the readers in better understanding. The Publisher of Programming Windows 8 Applications with C# is O'Reilly Media. O'Reilly Media is a well known and prestigious publisher especially because of their classic books related to the Computer Science field. This book covers all the related topics needed to build Windows 8 Applications. The Early Release Ebook of Programming Windows 8 Applications with C# consists of 525 pages. If you will buy an Early Release Ebook of Programming Windows 8 Applications with C# from Oreilly.com then you will get all the updates if any made in the final release. If any new chapter will be added in the final release of the book, you will get the Final Ebook. The Early Release of Programming Windows 8 Applications with C# was released in August, 2012 and the final release will be in December, 2012 (it is an estimated date and can be changed later). 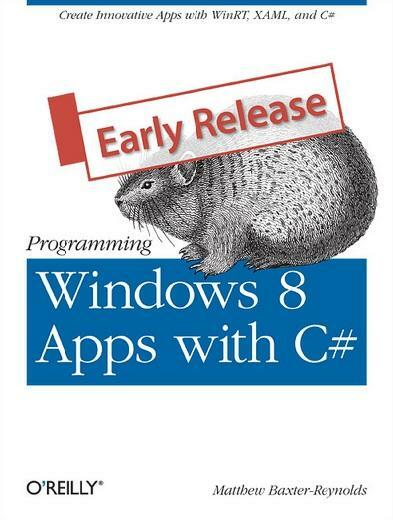 1)Buy Early Release ebook of Programming Windows 8 Applications with C# in 39.99$ only. This ebook is available in pdf format. 2)Pre-Order Print of Programming Windows 8 Applications with C# in 49.99$ only. This final edition is estimated to be released in December, 2012. Matthew Baxter-Reynolds is an author and also works as an independent Software Development Consultant in United Kingdom. Which is the best programming language to start with? In this article, I would like to explain different types of computer languages, similarities, differences and try to come out with the best programming language to start with in programming field.